CLEMSON, SC – Rising senior Catalin Baciu, better known as “Bobo,” has traveled to East Asia with the group Athletes in Action. He will participate in missions activities and compete with the United States `Eagles’ team through June 23. Baciu and the Athletes in Action team will compete against professional teams in East Asia and also conduct clinics for young children. Baciu is joined on the Eagles squad by Drew Barham (Memphis), Colton Christian (Michigan), Matt Dickey (UNC Asheville), Andrew Ferry (Cornell), Zachary Filzen (Buffalo), Titus Robinson (Buffalo), James Hulbin (Northwestern State), Stephen Thomas (IUPUI) and Andre Williamson (Appalachian State). The team will be coached by Morris Michalski, who has been with the Athletes in Action organization since 2004. 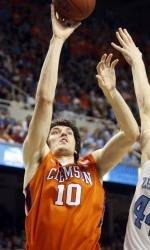 Baciu, a 7-foot-2 center, has appeared in 44 games over three seasons with the Tiger program. He has been a part of three NCAA Tournament teams. In 2010-11, he played in a career-high 23 games during Brad Brownell’s first season at the helm of Tiger basketball. He made 58.8 percent of his field goal attempts and increased his weight to over 250 pounds just before leaving for the trip to East Asia.